Establishing and maintaining a well-functioning, dependable sewage drain system is critical for any home. Installing and connecting the sewage line that runs from your home to the city line takes the expertise of a plumbing contractor to ensure it’s done right and is leak-free. At All County Plumbing LLC, we offer fast installation, connections, and repairs. 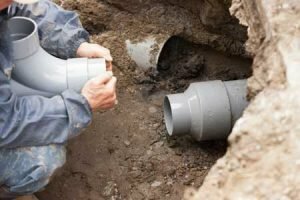 When a plumbing contractor specifically specializes in sewer line hookup, you can count on the installation of a durable connection that lasts for years, through all weather conditions. You won’t have to worry about leaks, odors, and health hazards of an incomplete, or incorrect hookup. Because all of the measurements are accurate, you’ll have a stable and solid sewer line hookup, and the work will be completed with minimal impact to your property! LOOKING FOR AN ESTIMATE ON A SEWER HOOKUP? What are the Benefits of Bypassing a Septic System? We understand the importance of having a good working sewer line that runs from your home to the city connecting pipe. Our contractor will complete the sewer line installation as quickly as possible. Whether it’s a line for a new home, a replacement sewer line, or you’re simply choosing to not use a septic system, you’ll have a new line and connection that’s dependable and affordable. Failures and damage to your sewer line hookup can happen from weather, clogs, age, material failure, and many other reasons. It can lead to major leaks of raw sewage that create unpleasant smells, constant wet areas in your yard, and the inability to use the drains in your home. All County Plumbing provides accurate diagnosis and repairs, including camera inspection. All repairs are completed to meet and exceed your drainage needs. Contact All County Plumbing LLC if you are in need of a plumbing sewer line hookup, sewer line installation, septic to sewer conversion, or sewer hookup repairs. We handle all types of sewage line problems throughout the Vancouver, WA, Portland, OR and surrounding areas.